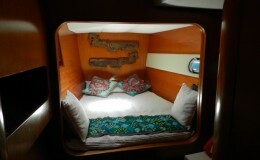 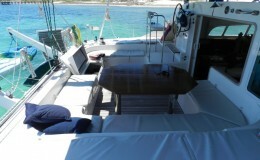 The open layout of this sailing catamaran provides for an equal amount of shaded and sunning for those who seek both. 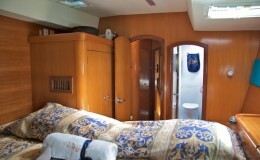 The living and dining area ample relaxation space while the separation of crew and guests living space provides for a high level of privacy. 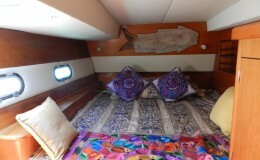 With a master and three queen size cabins and three full bathrooms, this well kept vessel will support up to 8 for sleep overs and up to 28 people for day charters. 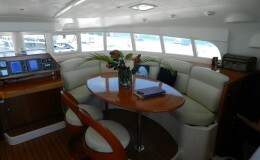 The wide open space on this vessel makes it a prime charter for most events and occasions. 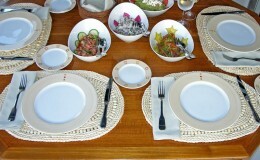 A full galley supports chef prepared dine in cuisine. 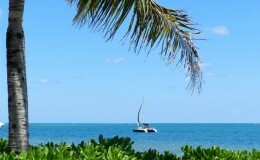 Whether it be sailing, fishing, snorkeling, kayaks or motoring around on a 14’ tender, this vessel comes with a healthy selection of water toys. 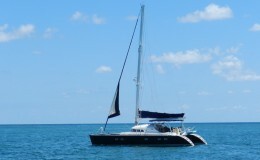 Other water gear is available upon request making this boat a fun one to charter. 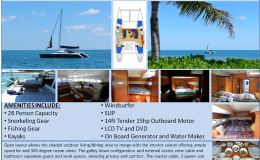 This luxury catamaran comes with a complete set of safety and navigation equipment making it suitable for oceanic journeys.